Start your homeschooling journey off right with the Bible-based, Horizons Complete Curriculum and Multimedia Set from Alpha Omega Publications! Two student workbooks, two teacher's guides, a resource packet, a sing along music CD, and a multimedia set lay a solid foundation for your preschooler's academic success. Give your preschooler a love for God and the world around him with Horizons Complete Curriculum and Multimedia Set. Based upon the Bible, this complete preschool curriculum contains 180 engaging lessons that help your child discover and learn social studies, language arts, math, phonics, and science from the viewpoint of the Creator. Arts and crafts, music, story times, outdoor excursions, and other exciting learning activities enhance each lesson's objectives and theme. Concepts are reinforced through games, songs, poems, and drama to prepare your preschooler for kindergarten in a Christian environment. Plus, comprehensive teacher's guides adapt to your homeschool schedule with flexible lesson plans that make teaching your child fun. The multimedia set includes an extensive list of music CDs and DVDs that perfectly integrate into each day's learning activities, providing everything you need for your preschooler's early childhood education. 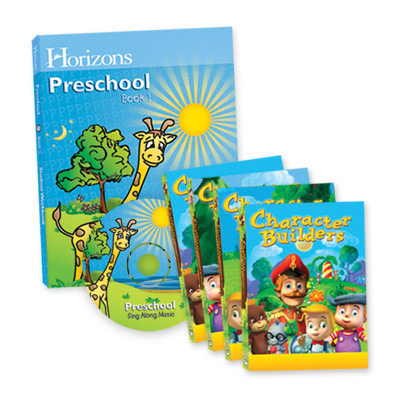 Order the Horizons Complete Curriculum and Multimedia Set today and start your child on a lifelong love of learning!